Currently I am inspired by khaki, teal blue, and green. Earlier today I was browsing J.Crew online and found this adorable khaki dress with a ruffle neckline. Later I about fell over when I found these gorgeous photos by photographer Claire Ryser. Perfect color combo for an elegant seaside / beach theme wedding! Don’t you agree? If you are looking for a more delicate approach to featuring the 2011 color of the year >> HONEYSUCKLE PINK << on your big day… no worries. Pair with MOCHA TAUPE + PISTACHIO GREEN. Elegant. Add a splash of pink here and there. And pistachio green for the tie, no pink! Perfect! Enjoy. WAHOOOOO! 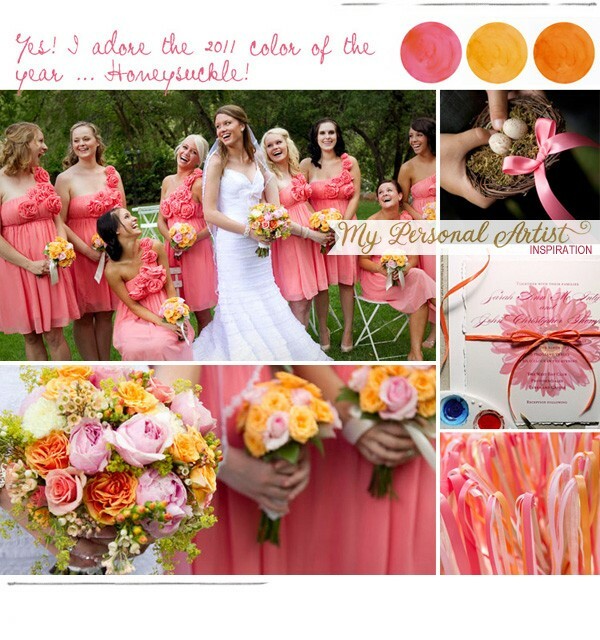 I am delighted to share with you the color of the year! HONEYSUCKLE PINK. Loveleeeey! I’ve been on the edge of my seat watching PANTONE’S FACEBOOK page like a hawk! Today it happened, early this morning they announced the color of the year. I am thrilled with their selection. Last week, I already incorporated honeysuckle pink in our new website design and gerbera daisy logo! Woot! What colors go best with Honeysuckle Pink you may ask? Back in November I created a color palette combination of ideas for you all. I had a feeling Honeysuckle would be a winner so I incorporated with a few different combos for you. You can download the color palette for your color combining pleasure! I will be posting many color combination ideas for you incorporating this lovely shade of pink!